Last year, I took these photos shortly after Memorial Day and had wanted to do a post on them. Time, being slippery and kind of rubbery, a bit like an octopus wriggling out of water, had different ideas, and then it was too late... It was June, the beginning of summer madness. I was inspired by reading A Maui Blog's recent post on Memorial Day, and figured late is better than never. I was so intrigued with these pictures when I took them. The day was bright and hot. The wind was waving the flags across the field, like grass bending in the wind. And there were leis and flowers everywhere. 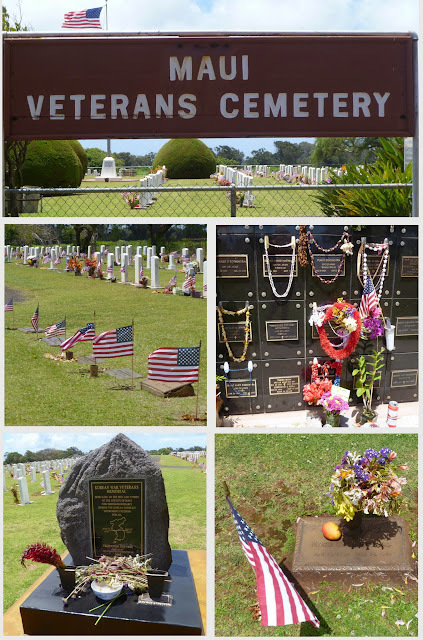 Not like I think Memorial Day in a cemetery on the mainland. Not proper and regal, but more flowery and exuberant, but still honoring those who served. My favorite picture is the one on the bottom right, with the mango. It was so personal and poignant. Not just flowers for the fallen, but a mango too. This person who served, loved mangoes.